Eleven years ago I made a brief visit to Beech Bend as part of a fun but incredibly stupid detour of almost one thousand miles on a route between Worlds of Fun and Silver Dollar City. At the time the park had just installed a spectacular new wooden coaster that stood out as the only significant attraction among a collection of run-of-the-mill carnival rides, many of them still mounted on trailers. The park had a fairly difficult season in 2015 with two separate accidents in less than a month. 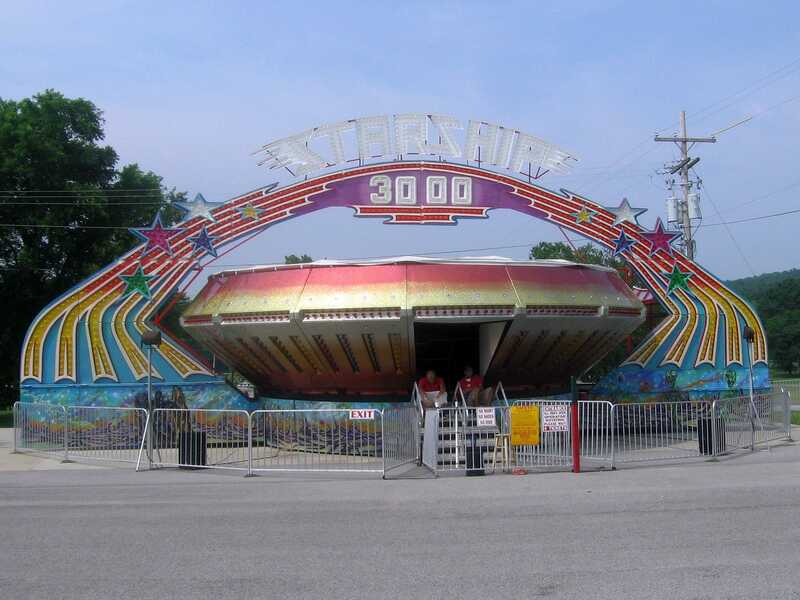 The first occurred on July 25th, when the Jitter Bug swing ride collapsed injuring twelve. On August 16th the Dragon suffered a derailment after two segments of track separated during regular operation, and while nobody was hurt on that occasion the incident still received widespread press coverage. Today it was obvious that changes were happening; quite a few of the older attractions had been repainted, upgraded, or even replaced, presumably to reduce the risk of further incidents, and there was construction underway in the water park. We began our visit with Spinning Out (#2266), an extended version of the compact spinning coaster from SBF Rides and one of four models to open this year, the others being at Mer de Sable, Tivoli Friheden, and Santa's Village. The upgraded model adds an additional crossover to the usual figure eight, giving the ride a somewhat larger footprint, though it's worth noting that the capacity remains unchanged as both versions run a single four car train. The experience on this unit felt no different to the smaller versions, and given that, it seems unlikely that it will sell in the same quantities, though time will tell. Our second stop was at Zero-G, an ARM-built drop tower added to the park for the 2012 season in place of the smaller Shock Drop. The car made a very brief pause at the top of no more than a second before being released to fall back to a (mostly) smooth landing at ground level. The ride was decent enough, with an intensity level broadly equivalent to Intamin towers (though several notches below the boosted Fabbri versions). 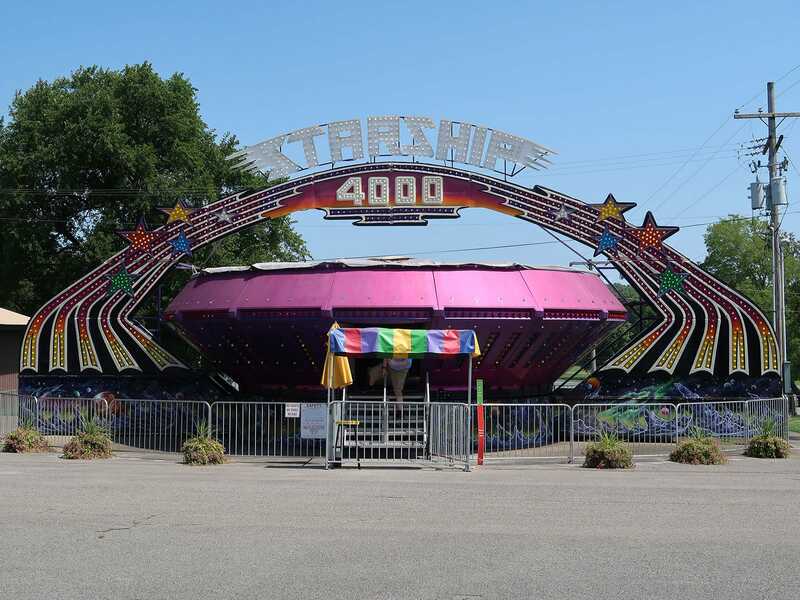 On my first visit to the park the Haunted House building contained a Pretzel dark ride with rotating cars that had originally operated at nearby Funland Park. The scenery inside had been assembled from a variety of different rides, and it's fair to say that it was both sparse and disjointed, or as Megan would say, hokey. Park management decided to do a major refurbishment for the 2011 season that brought new track, new cars, and some extremely high quality scenes including quite a few animatronics. Better yet, the air conditioning system was as good as ever, making a nice break from the outside heat. Our next stop was at Wild Mouse. 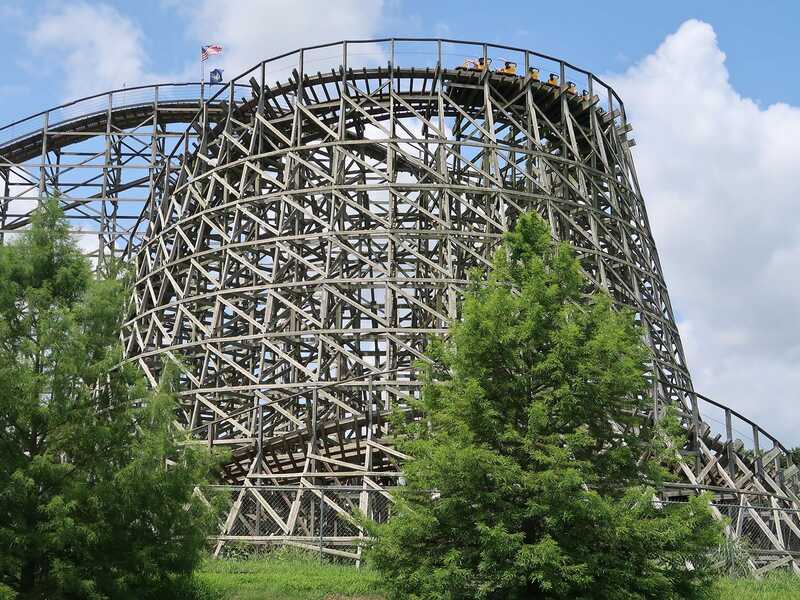 My old trip report described how the cars on the ride were crashing into every single turn in the upper section of the ride with a violent thump, and that was still the case today over a decade later. The second section of the ride felt much better thanks to some superb spinning, and I was right on the verge of saying something nice when we reached he straightening device on the brake run that stopped what had to have been a revolution every two seconds in an instant. The resulting collision was more than strong enough to break things; both of us were thrown to one side, and we could actually see the track in front of us vibrating from the force of the impact. We subsequently watched the same abrupt slam with another car, indicating that there was something very wrong with the underlying hardware. Our next stop was at the Antique Cars, an Arrow Development installation that opened in 2002. Megan took the driver's seat for our ride and reported oversteer, though as with all attractions of this type there was a guide rail in place to prevent off-road excursions. The vehicles were powered by small lawnmower engines and had a top speed of around five miles per hour. We followed that with a similarly sedate visit to Granny Jones Petting Farm, home to around a dozen friendly goats (on the ground). The final ride of the morning thus became the one that readers would presumably have expected us to begin with, Kentucky Rumbler. It looked to us like the single Millennium Flyer train had been refurbished in the recent past; the logo plate was gone from the front, and the upholstery was somewhat different to the norm. We decided to go for one ride in the front followed by one in the back, and I can report that the latter was the more comfortable, delivering a remarkably good ride. As we disembarked we noticed a plate on the station platform dedicating the ride to all members of the American Coaster Enthusiasts, a lovely gesture reflecting that club's status as the premiere organisation of its type in the United States. Our original plan for day eleven of our trip was to spend a few hours at Beech Bend followed by a seven hour drive to our overnight hotel next to Cedar Point, which we hoped to reach in the early part of the evening. 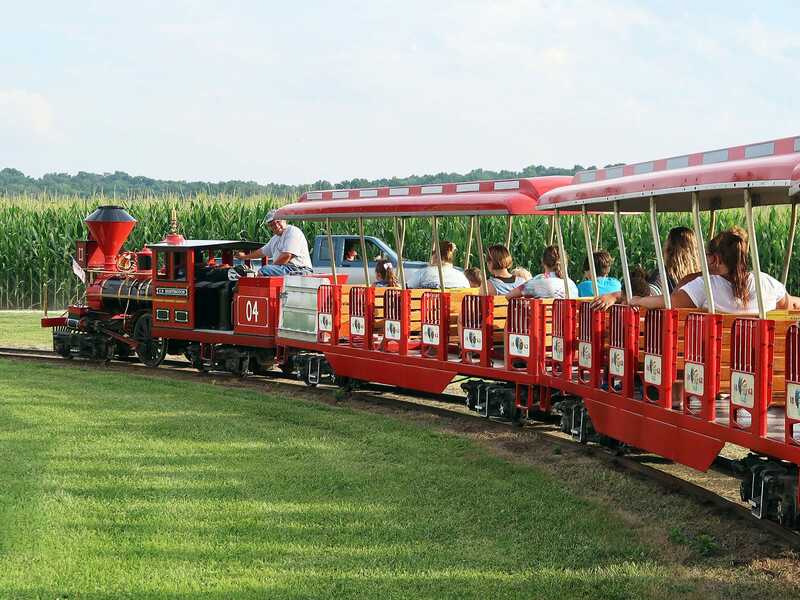 It was only a few weeks before travel that I realised that our route took us within twenty miles of Stricker's Grove on one of the eight days each year that it opens to the public. We needed to break the driving somewhere regardless, and the fact that Megan had never been to the park before sealed the deal. We met Maria at the park gate and headed directly to Teddy Bear, the smaller of the two coasters and a copy of a PTC ride that operated at nearby Coney Island Cincinnati from 1935-1971. The ride featured buzz bar restraints, and though it was small it was nevertheless perfectly formed. We didn't notice any perceptible forces in the front of the train, but there was a small amount of airtime to be had in the back. The cars on the train were large enough to seat two adults comfortably, a refreshing change from most wood coasters of this scale. We were rather more taken with Tornado, which also featured buzz bars. I'd always thought this coaster was an in house design by Ralph Stricker, but it turned out that this too was a copy of a PTC ride, in this case a mirror image of Mighty Lightnin at Rocky Glen Park, which operated from 1959-1987. The ride was running well today, though it did seem like the demented mid-course drop I wrote about in 2005 had been significantly tamed, to the point that it wasn't noticeable at all in the front car. The back seat was great, though, and we completed several laps. One of the highlights of our evening was the Train that took us on a ten minute journey around the outskirts of park property. We could see from this vantage point that only about a quarter of the land was in regular use, with the remainder available for overflow parking and special events. Most of the journey was flat, but there was a brief tunnel underneath the main access driveway which prompted a chorus of screams. Though we'd not planned on doing any other rides we decided on a whim to enjoy the Merry Go Round, a Herschell model dating from the 1950s with a slightly out-of-tune Stinson 30M-1 band organ at its center. I've said it before, but it bears repeating: a carousel just isn't the same without a fairground organ; manufacturers who build cheap and nasty equivalents with speakers (or worse, no music at all!) should hang their heads in shame.